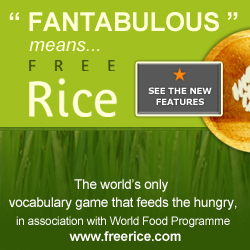 Be The Change: It's Rice...And It's Free. This is a bowl of rice. Well, technically it's just a lot of pixels, but we won't go into the technical stuff. So for right here, right now, it's a bowl of rice. 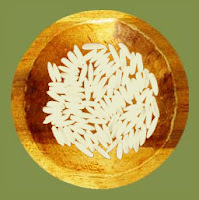 A bowl that will be filled, ten grains by ten grains, for every question that is answered correctly in an online quiz. A bowl that, when filled, will be given to somebody in a Third World country who needs food. And it's up to your next door neighbour to fill it. It's not up to your neighbour. Nothing on this site is up to your neighbour. This, that, everything is up to you. Not clear enough? I'll say it again. You. Y - O - U. YOU. Not your neighbor. Not your friend. Not your parent. Not your sister. Not your partner. Not your goldfish. Everything I talk about on this website is up to you. YOU. You're probably thinking "Big responsibility here. It's not just me on this earth, why do I have to do it all?" The answer is - because together, we are stronger. Let's look at this a different way. Back to the rice - remember? The bowl of rice? To feed the hungry? Yeah, that. Back to that. In 2011, statistics showed that over 30% of the world's population had access to the internet. That's over two billion people. 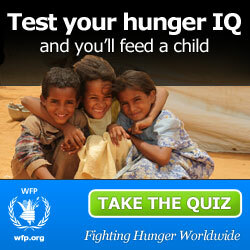 Now, let's say that every one of those 2,000,000,000+ people went on to this online quiz that fed the hungry. And let's say they all answered one question. That's over twenty billion grains of rice donated to the hungry - in just one day. Next, let's say that everybody took about five minutes to answer 10 questions. That's over two hundred billion grains of rice donated to the hungry - in just one day. Okay, now let's say that everybody spent five minutes to answer 10 questions, every day of the year. Now at this point my calculator brain stopped working, so if google my maths skills are correct, then that is over seven hundred and thirty billion grains of rice donated to the hungry - in just one year. Now that should be enough maths for a year. It should be enough maths to convince you that together, if we all answer a few questions, we can make a big difference. Freerice is a terrific web site. I have used it many times with my English class and they enjoy the challenge and they REALLY like to know that it's real and they're helping charity every time they get a word right, once I assure them it's genuine. I discovered it, oddly enough, in an online ESL newspaper, but never thought it would be ongoing.